Institutional Review Blog: Dingwall Links Ethics Review to University "Command and Control"
Dingwall Links Ethics Review to University "Command and Control"
Robert Dingwall argues that ethics regulation is just one part of a corporate model that threatens innovative research in universities. Dingwall identifies a key tension in social scientists' demands for greater freedom from ethics regulation. Scholars' claims for the social value of their research can become an argument for academic freedom or for more central control of their work. On the one hand, social scientists may need to assert the value of their work beyond their own desire for freedom. "Professions are afforded autonomy because there is a societal benefit for this," he explains, "not simply because they have captured legislatures and obtained favourable legislation." By the end of the century, research has changed into an activity done under contracts with specified processes and outcomes. In United Kingdom, and European Union, funding, it is the language of ‘deliverables’. Researchers are expected to describe in advance what they expect to find and to be evaluated on that basis. This is a recipe for incremental rather than breakthrough science. The historically decentralised nature of universities, with faculty grouped in small, relatively autonomous, production units in close proximity to their distinctive markets is an evolved solution to the challenge of innovation very much of the kind currently envisaged by leading management theorists. There is a certain paradox in that the strengthening of central control, by measures like ethical regulation, quality assurance, and research performance management is introducing the sort of corporate model that has clearly failed to sustain and profit from innovation. 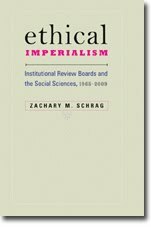 One of the most important arguments against ethical regulation may then relate to its place in a wider structure of command and control that is actually inimical to one of the most important institutional goals of a research-oriented university system – if universities cease to generate revolutionary science, what is the point of universities?